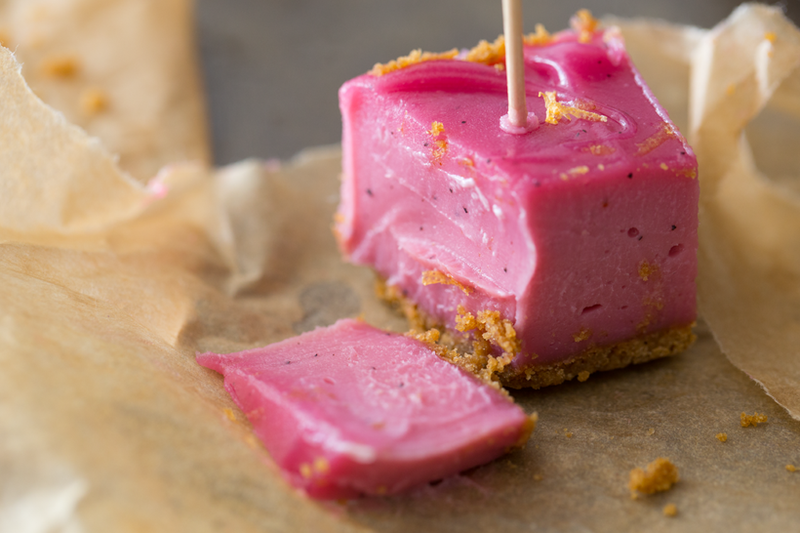 No-bake, gluten-free Pink Flamingo Vegan Cheesecake Bars, made from creamy cashews, rich coconut oil, hot pink pitaya, zesty-sweet grapefruit and enchanting vanilla. 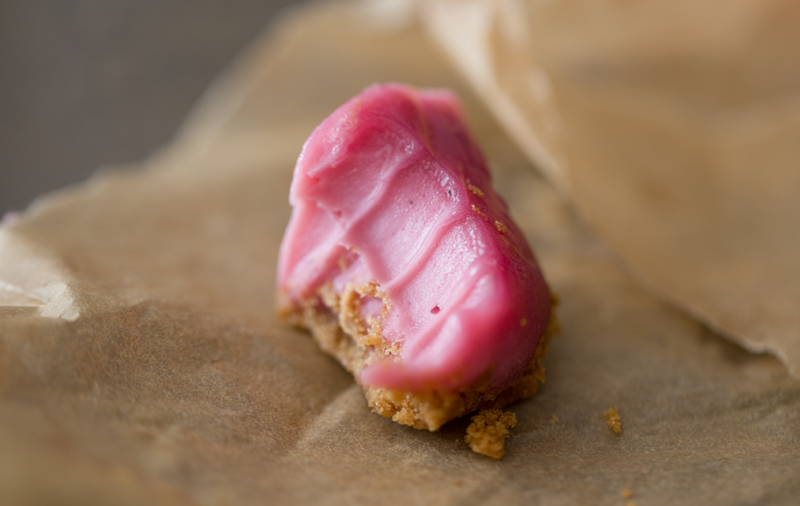 Fuel your imagination with each flamingo pink bite. Get the recipe and some imagination-inspiration.. 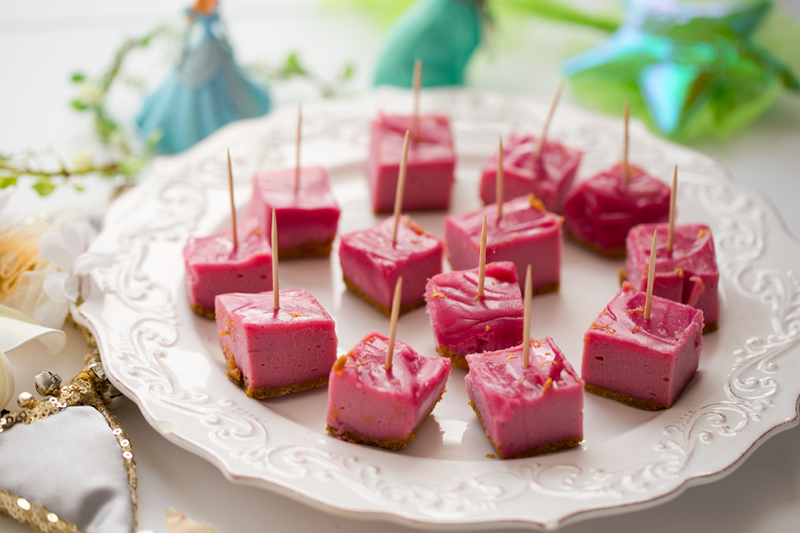 I love colorful, playful recipes like today's treat! 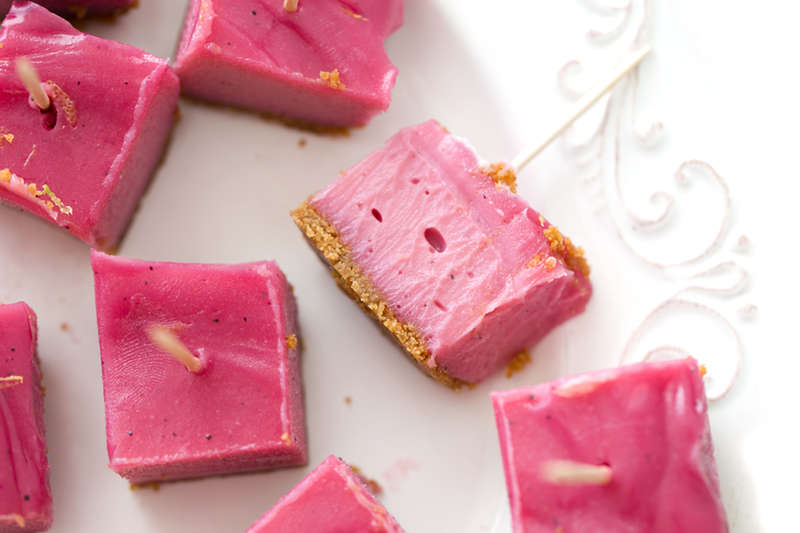 These flamingo hot pink bites are an easy way to liven up a work day, party or movie night. Kids of all ages approved. 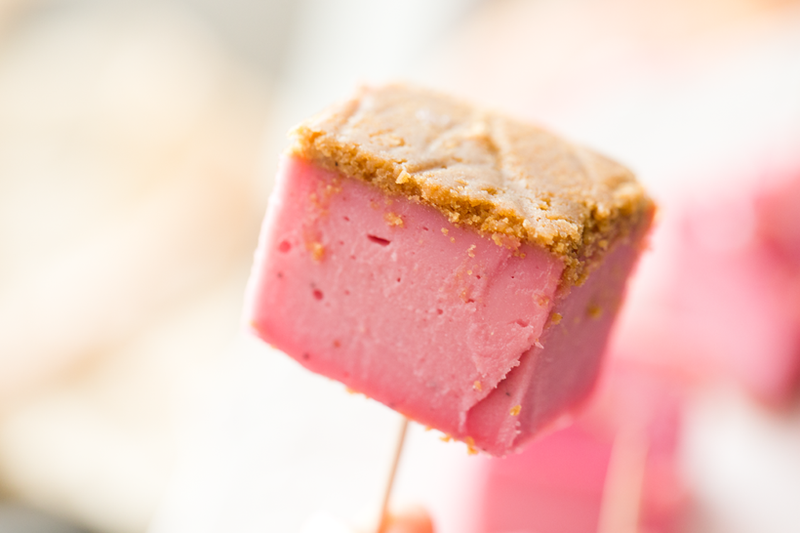 These are creamy, sweet and totally cravable. I could not stop nibbling them. 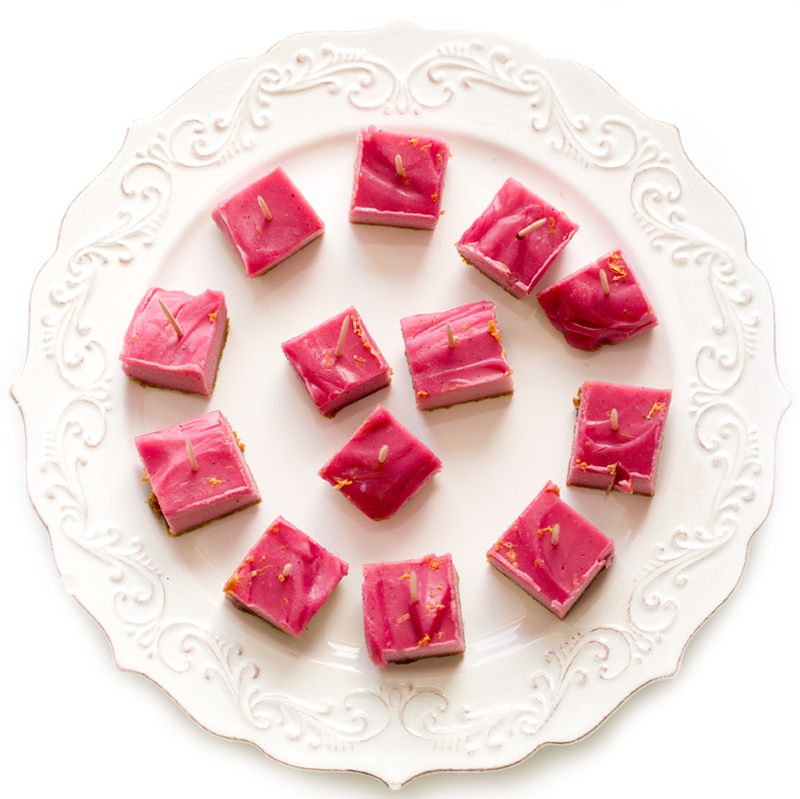 These cheerful, flamingo-colored treats are perfect for a summer party. Not a Pink Fan? Just a heads up, if you don't want pink bars, you can totally do gold bars (turmeric), purple bars (blueberries), green bars (matcha), brown bars (aka chocolate-y) or even spooky black bars (activated charcoal). Imagination. In my opinion, imagination is one of the most powerful tools we have in this life. When we were kids, 'using our imaginations' meant knowing how to play pretend, and effortlessly hop in and out of magical worlds of make believe. Worlds crafted from bedtime stories, movies, stuffed animals, costumes, toys, pen and paper and whatever else we could get our minds wrapped around. But as adults, we tend to force ourselves out of that world of make believe to step boldly into the "real world." You remember, there was a whole MTV reality show on this harsh transition into "real" life as a grownup. But the truth is, we really can have the best of both worlds. All the advantage, responsibility and opportunity that being an independent, knowledge-filled adult brings us -- while not needing to let go of those magical worlds within our hearts, minds and souls. Imagination for adults is less about playing pretend and dancing around the house in a Disney princess costume, wearing a crown and messy red lipstick, while sipping invisible tea from a plastic tea cup. It is all about being able to use your imagination to improve your adult life.. Imagine it. Manifest it. Dream it. Do it. Dream up happiness in each day, figure out how to turn your sometimes daunting "adult routine" into one of inspiration, fun, hope and creativity. Dream up solutions to everyday annoyances like fatigue, stress and boredom, while also dreaming up solutions to big picture life challenges. Imagine how you can reach your big goals in life. Getting a dream job, buying a house or living in your dream town, starting a family, having the best friends in your life, traveling, being able to give back and discovering your best self -- all those things start with a little imagination. So you don't need a wand or glitter or robots or Harry Potter books or video games or even a trip to Disneyland to get started. You just need to turn off your "adult" brain for a little while and sink back into your childhood self. The one that could literally dream his or her way out of just about anything. Turning off your typical adult brain means hiding your phone for a few hours and closing your laptop. And finding time. That's the challenging part. But like exercise, the more you do it, the easier it becomes. So if you find 'meditation' a huge challenge. Try imagination-ing. Here are a few ways to get started!.. * Pen and Paper. Pull out a pencil and paper and start drawing, doodling or writing. 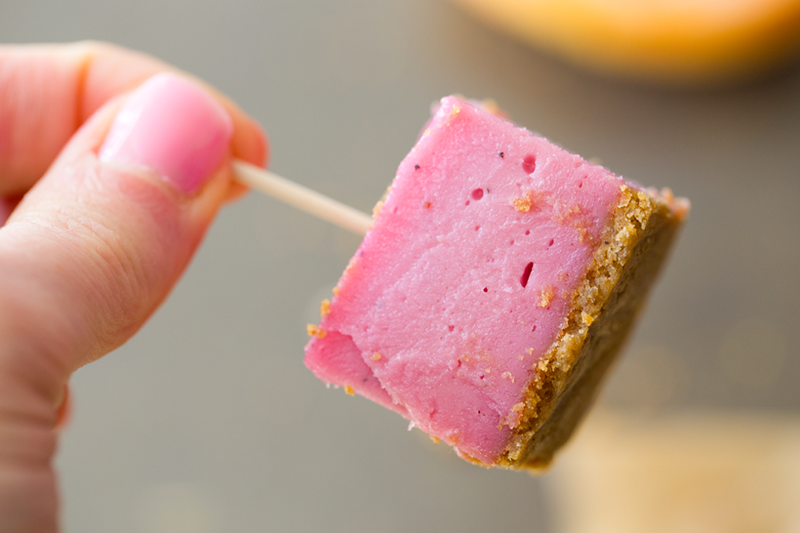 * Get in the kitchen and make these bars! Or another colorful recipe. Smoothie bowls and big colorful salads are fun to create too. * Daydream. Close your eyes and go the meditation route. But instead of thinking about 'nothing' try thinking out your dreams and how you can build a path to them. * Meet up with a friend and start talking about your daydreams. Ask a friend what their three biggest dreams are and give them your advice on how they can get there. * Watch a movie that is the complete opposite of what you do for a living or that you think about in everyday life. * Seek out art or theater in your community. View the other worlds artists have created for you. * Nature. Find a really peaceful and kinda magical spot in nature. A beach, park, hillside. Feed off that energy. * Work it out. Sometimes sweating it out at the gym or in a sports sesh is a great way to get your imagination humming. And today, these bars are perfect Imagination Fuel. 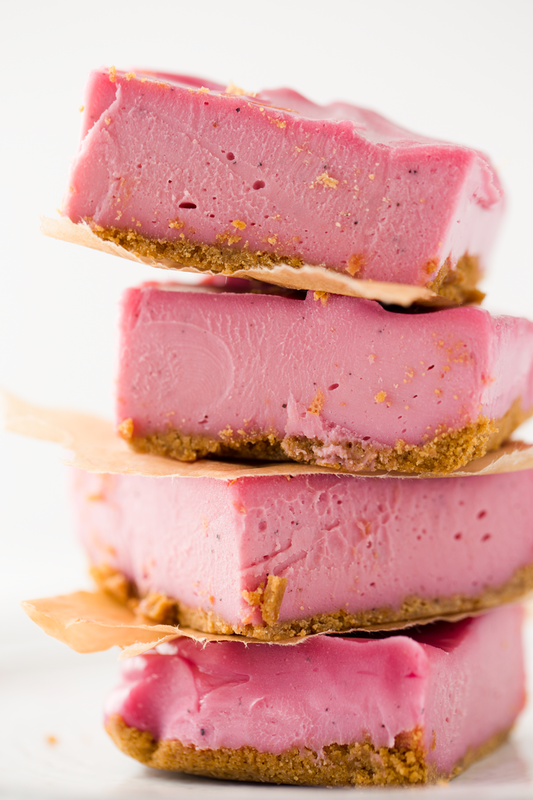 They are light and creamy and oh so rich and dreamy. They have a subtle, sweet vanilla-maple-citrus flavor. 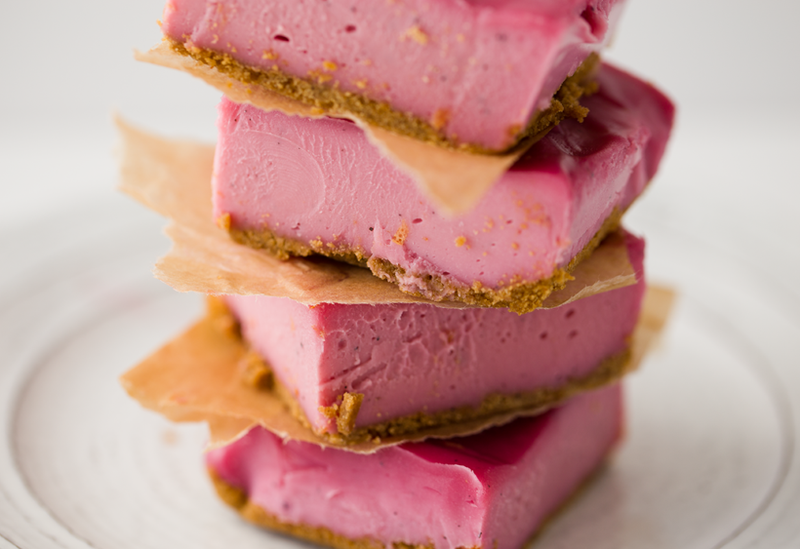 The gingersnap crust is a nice spicy accent to the silky texture. I want to know: How do YOU use your imagination? What do you do to make sure your adult world stays as creative, fun and light as possible? Enjoy and have a beautiful weekend everyone! 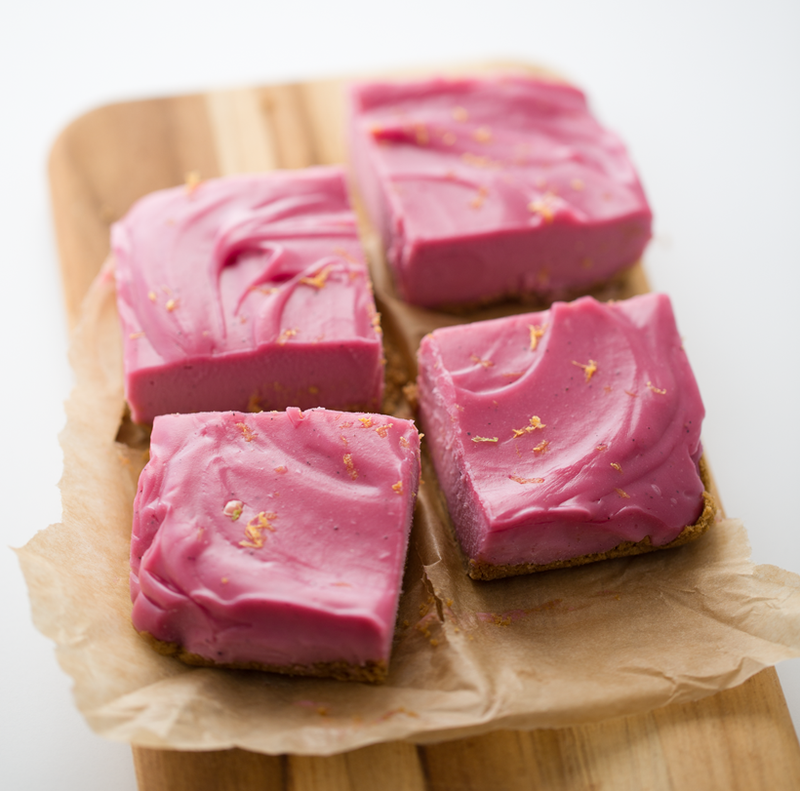 These Pink Cheesecake Bars are made using cashews, coconut oil and pitaya. Raw and vegan. For these bars, I used a 5" x 5" square dish. It made 4 very thick bars. You could double the recipe and fill a large dish - or try to use whatever dish you have on hand. The dish size will change the thickness of the bars. Prepare the dish by layering it with parchment paper. In a blender, process the cookies until they become a fine powder. Transfer the powder to a small bowl and combine with the crust oil. Then pour the oiled crumbs into the parchment-lined dish and flatted down a bit. This doesn't have to be donw perfectly, the cashew mixture does an excellent job of soaking up the crumbs and helping with binding of the crust. Pour the filling into the dish, over the crust and smooth with a spatula. Add the citrus zest on top. Chill in the fridge overnight or for at least a few hours. Slice and serve. 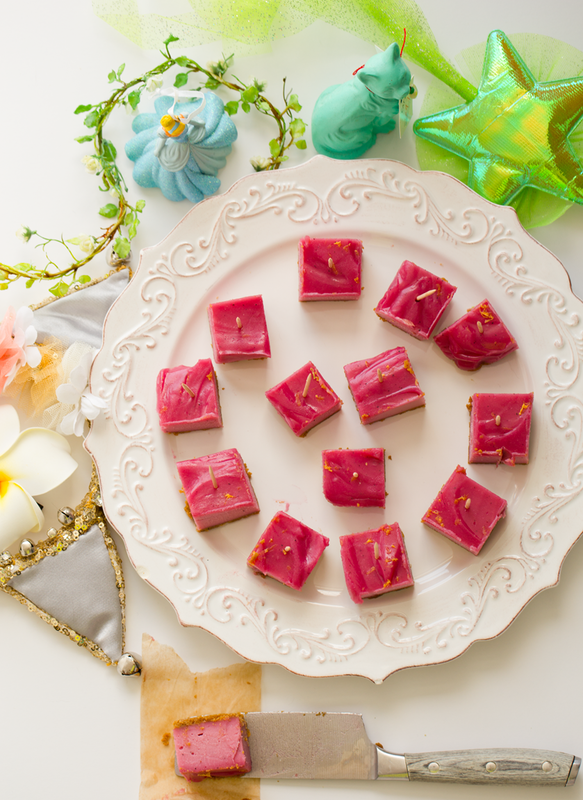 The bites will soften up pretty quickly, so if serving for a party, you will want them to be served within a half hour or so or presenting them. Otherwise, serve them on some ice to keep them nice a firm. I like these slightly soft - which is the texture they get after about 15 minutes at room temperature. 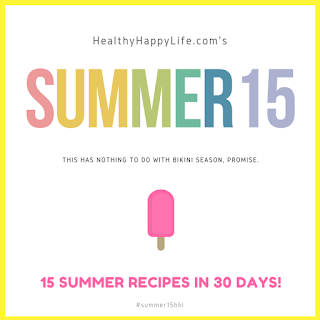 This is recipe #2 in my Summer15 Challenge! details here.